T-Mobile added over 1.3 new customers during its second quarter, marking the 17th consecutive quarter with over 1 million net subscriber additions. Over 800,000 of the new subscribers during the most recent quarter were postpaid subscribers, which are the most coveted group of wireless users, and the wireless provider said it expects its growth in that sector to lead the wireless industry. Revenue was up 10% ending the quarter at $10.2 billion while its profit soared 158% to reach $581 million. T-Mobile, based in Bellevue, Washington is the third biggest U.S. wireless carrier behind Verizon and AT&T, its two biggest rivals. However, one big question asked during a conference call was over the continuing buzz about the consolidation within the industry, including the link that has been long-rumored between Sprint and T-Mobile, reported talks about a partnership between the Dish Network and Amazon and the agreement between Charter Communications and Comcast to cable giants. John Legere the CEO at T-Mobile said the company knows Sprint must do something, acknowledging the fact T-Mobile has interest in the possibilities of doing something with its rival. However, Legere added T-Mobile is interested in the focusing of its business and doing things methodically, at its pace and its schedule. Legere was critical of the agreement made between Charter and Comcast not to enter in acquisition in the wireless industry alone for the next year as part of a broader partnership. He said they made the huge move of deciding they are sitting together and not do anything for one year, which he said sounds like a restraint of trade to him. Asked about the possible regulatory obstacles to mergers between wireless carriers, which blocked the T-Mobile and Sprint merger, Legere said that the activity beyond the four big wireless U.S. companies is evidence the industry is far larger as well as more competitive than it appears. Legere added that all the noise and activity that is going down make it plainly clear there are not only four players any more. There are many more than just four including a new group leaning on the outside trying to enter the playing field. Although 1.3 million net subscribers were added by T-Mobile during its recently ended quarter, the company’s count officially dropped from 72.6 million to 69.5 million. 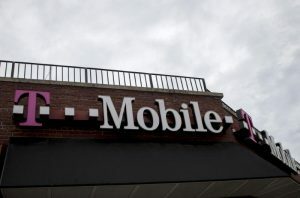 T-Mobile said it stopped taking into account 4.4 million wholesales clients it has that were reported previously as part of it Lifeline program for customers who are low income.